A new review has been posted on the website for Thicker than Water. This is the first of three movies in the Vampire Diaries Trilogy by Writer/Director Philip Messerer. Great review. Based on your review, it doesn't sound bad, but it looks really...low budget, or cheesy (don't like that word,but couldn't think of a better one). I have not read the books, someone told me they weren't that good. It may be something to watch though, even for a laugh. Sounds like something I'd watch. I was thinking also that it looked low-budget cheesy but I read your comment, not too bad. Is this movie available to rent? Donna - When I sat down to watch this I expected the action and the acting to be limited, so I was really surprised to find that they did such a good job. It's a lot of dark, indoor shooting (which you'll find in nearly every horror you watch anyway). What I consider dark humor could be viewed as cheesy by some, but when a vampire shows up at the door covered in blood and still wearing most of the body bag they were carted away in, how can you not laugh? 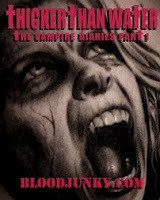 :) I don't know if you can rent it, but it is listed on DVD at Amazon as Thicker Than Water: The Vampire Diaries part 1. I'll need to check for it next time I hit the store. I'm always in the mood for a vampire movie - low budget or not. Been fascinated by them for as long as I can remember. Although, I'd seen a Steven Segal vampire movie at the video store awhile back, I didn't even go near that one. LOL! I haven't watched that one yet either! (Against the Dark) I guess it was released right to DVD. Have you seen the trailer?